"I am the senshi of love and exams! 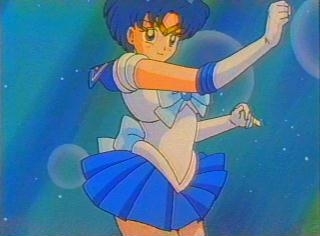 Sailor Mercury!" Ami is a very sweet and brilliant girl with an IQ of 300. She is also very shy and modest, but being one of the Sailor Senshi has helped her a lot to come out of her shell and be more confident. DIC called her Amy from the start. She also goes to Juuban Junior High school, and later, Juuban High. Her boyfriend is Greg, one of the Rainbow Crystal carriers. Her castle is the Mariner castle.